The freebie of the day is an original UI kit crafted specifically for online shopping and e-commerce websites. This free sample includes 2 templates generated by 20 different components that can be easily edited in Sketch. 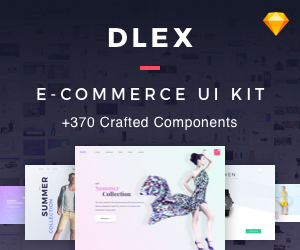 If you like this freebie, go ahead and check out the full version of Dlex E-Commerce UI Kit including +370 components.